In her telling, Muslims were the real victims of 9/11 because, according to her, their rights were violated in the aftermath. Omar’s defenders, including Rep. Alexandria Ocasio-Cortez (D-NY), are reinforcing that claim by turning Omar into a victim in the present debate. In truth, Omar’s revisionist version of history reveals something important about the myopic nature of her world view. 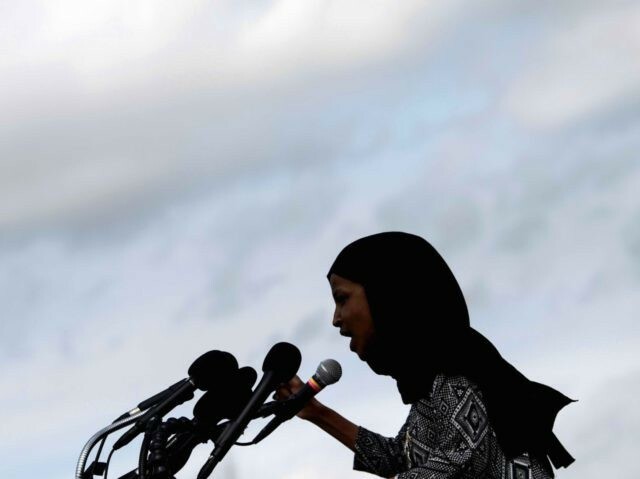 Just as she turned House Democrats’ weak response to her own antisemitism into a victory for Muslims (by claiming, falsely, that their resolution was the first time Congress had condemned anti-Muslim bigotry), Omar has inverted the terror committed against Americans by Muslims in the name of Islam into an attack on Islam by the American people. A few weeks after the attacks, the U.S. went to war in Afghanistan — not just to destroy Al Qaeda, but also to liberate millions of Muslims from the oppressive rule of the Taliban. The case for democracy in the Muslim world would soon become the most important justification for President George W. Bush’s war on terror, as the U.S. toppled Iraqi dictator Saddam Hussein in 2003. Later, Bush sent tens of thousands of additional troops to quash Iraq’s terrorist insurgency. Thousands of Americans were victims of radical Islam on 9/11; thousands more died in the Middle East to defend the human rights of Muslims. That cause now appears ill-fated, given the cultural illiberalism of the Arab and Muslim world. But there can be no doubt that the practical consequence of 9/11 was that Americans rushed to defend Muslims from terrorists and tyrants in the Islamic world who had also became a threat to the safety and security of Americans. There were many Muslims who condemned the 9/11 attacks. But others — a minority — celebrated 9/11, particularly in the Palestinian territories (creating a public relations disaster so terrible that then-Palestinian Authority leader Yasser Arafat, a terrorist himself, faked a blood donation for the benefit of the victims of 9/11). Then-candidate Donald Trump drew criticism in 2016 for remembering (albeit very inaccurately) that a few Muslims in America had also celebrated. Radical Muslims were not alone in celebrating: many in the western world, particularly on the left, also celebrated — something I observed first-hand in South Africa at the time, where the media and political elite shared the feeling that America had finally been humbled. Indeed, Omar’s own worldview seems to have been shaped by the academic left just as much as, if not more than, her Muslim background (as evinced by her odd passion for the transgender cause). One of the central themes of the left is that “oppressed” or “subaltern” groups do not have agency; they are just victims. Muslims, to Omar, are powerless to question themselves critically, or to better their lot. It is not a view shared by all Muslims, but it does hurt Muslims as a whole. "the best crime thriller I've read in years"
Do you approve of the State of the Union Message? Who do you believe, Judge Kavanaugh or Christine Ford? If the Pope knew about McCarrick’s behavior, should he resign? What should President Trump do about illegal alien children? Who is most responsible for the Parkland shooting? Will the Democrats leak the Schiff Memo to the news media before it is released?